Marin County’s Flood Zone 3 Advisory Board held a public meeting on November 18 in Marin City to hear presentations on a number of matters of concern to the Floating Home community. After brief presentations on the Coyote Creek Levee evaluation upstream in Tam Valley, and Marin City drainage issues, the bulk of the meeting concentrated on the flood preparedness plans for Manzanita and the Richardson Bay Shoreline Study. The board was also brought up to date on the progress to prepare a Southern Marin Watershed Program and Watershed Guide. The essence of the presentation on Manzanita flooding was that no short or even mid-term fixes to the current flooding situation at king tides exist. Nor do they have a solution for the situation that would result from rising sea levels. The County is currently concentrating on public notice of closures of the parking areas when there is flooding. The members of the public attending the event voiced disappointment and disapproval of the situation and asked about numerous possible improvements including re-locating Route 1 under Route 101, utilizing portions of the Manzanita maintenance yard, examining the lease for CalTrans-owned parking north-east of the Route 101 bridge approach and possible use of the older roadway of Route 1 along the Fireside property. No decisions were made, but opinions were heard. The bulk of the evening’s program was the presentation of the Richardson Bay Shoreline Study. The study assesses the threat to infrastructure in and around the bay for three different sea level rise scenarios — 1, 3 and 5 feet. A number of alternatives are discussed in the report including hard engineering (levees and flood walls) and soft engineering (enhanced wetlands) as well as zoning and lifestyle adaption options. 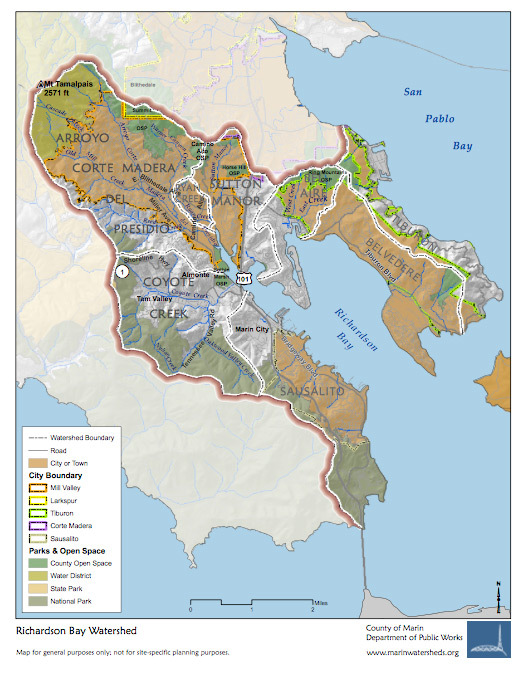 The draft study has been posted to the Marin County Watershed Program website for public comment. Spring 2016 finalization is expected.